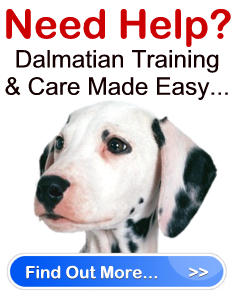 Dalmatians – High Energy And Full Of Love " "
Dalmatians have plenty of stamina and are extremely energetic. They are very playful and active, and are well known for their hyper nature. They do not like to be left alone with nothing to do all day. The Dalmatian is a lovable and devoted dog. He is happiest when with his owner, and will become depressed if left alone for too long. The Dalmatian is intelligent but he is also stubborn. He requires proper and consistent training and should be well socialized. However, when trained well, Dalmatians are incredibly obedient and make ideal watchdogs. Dalmatians are not a good choice for first time dog owners, or for those who have young children. However, for those who are compatible with this breed, the Dalmatian makes a fantastic companion that is a devoted and affectionate pal. Although Dalmatians are commonly believed to be British because of their popularity among English aristocrats particularly during the 1800’s, the actual origin of the Dalmatian is still debated by historians. Some historians believe that Dalmatians were established in northern India and were eventually brought to Europe by gypsy caravans in the Middle ages to Dalmatia, Yugoslavia. Others think that the Dalmatian breed developed in Greece or Egypt before coming to Europe. The Dalmatian was used as a shepherd, draft dog, ratting dog, and a guard dog for coaches and carriages. However, their main purpose was to run alongside or under horse drawn carriages. In order to live up to their job, Dalmatians had to have a huge amount of energy and stamina. Today the primary job of Dalmatians is to be wonderful family companions; a job they do very well. Dalmatians are part of the Gun Dog or Non-Sporting Dog group. They are a tall dog and stand 22-24 inches at the shoulders, and weigh between 45-70 pounds. They are extremely active and are high energy dogs. Therefore, these dogs require plenty of exercise and are not ideal apartment dogs. Their daily exercise should include at least 2 long walks (20 minutes or more), plus the ability to run around free in the yard and playtime. Because they can be quite hyper, Dalmatians are not good to have in homes with really small children as they can be easily, accidentally knocked down by the dog. However, aside from that, the Dalmatian gets along well with children and loves to play with them. They even tolerate other family pets well. The only time other pets may present a problem is if you have a male dog and a male Dalmatian. They may show aggression towards each other. Dalmatians require proper obedience training. Consistent and persistent training is the only way to ensure the dog listens to your commands and doesn’t become stubborn and ignore you. Although the Dalmatian requires plenty of training and socialization, they generally like people, and are not aggressive towards strangers. The coat of a Dalmatian is extremely easy to care for because the Dalmatian does a good job keeping himself clean. He doesn’t have the characteristic doggy odor and avoids getting dirty. That being said, Dalmatians do shed their sleek, short haired coat twice a year. During these shedding seasons be prepared for plenty of dog fur around the home. The life expectancy of a Dalmatian is 11-13 years. This breed is prone to a few hereditary problems such as skin allergies and hip dysplasia. However, their biggest hereditary health issue is deafness. Approximately 10-12 percent of all Dalmatians are deaf. Therefore, all puppies should be tested at birth, and your dog should be monitored for this condition throughout his life. Dalmatians are wonderful and devoted companions and are the perfect pal for the active individual or family.